Building a non-loadbearing stud wall is the normal way to subdivide a room, but if you are doing this in a basement or some other place where the floor is made of concrete, a better option is to do this with concrete blocks. Concrete blocks can still be faced with plaster or drywall, and they have much greater support strength than either. Use the circular saw to cut a few blocks in half. The blocks need to be laid in an alternating pattern, where the joining line of two blocks rests beneath the center of a block above them. This means you will need to start with at least a few blocks cut in half to begin the alternation. Prepare your mortar. Mix your mortar in the bucket, using the instructions provided with the mortar mix. You will only need modest quantities at any one time, so don't mix a lot, or it will settle and harden before you can use it. Pour the ready mortar onto the wooden board for use. Mark your wall line, using twine and a tape measure to make sure the line is straight and meets the existing walls in the right places. Screw the galvanized metal block channels into the existing walls. Lay your first line of block, starting with a regular, uncut block placed into a metal channel. Use the trowel to apply mortar in an even layer. Be sure to leave a properly measured space if you wish to put a door frame into the wall. Lay the second line of block in an alternating pattern for added strength. Check this and each new line of block with a level as you go, and adjust the amount of mortar you are troweling out as necessary. Lay your third and fourth lines of block just as with the first two, and then stop. 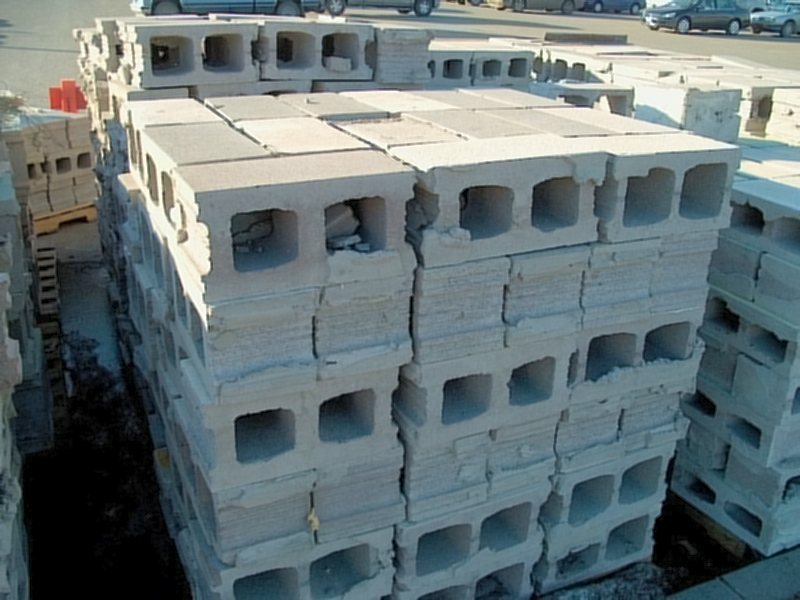 Allowing the mortar to properly set means not putting too much weight on it, and four rows is the norm for standard concrete cinder blocks. Allow these two to dry before proceeding. If you feel you need a stronger wall than mortar and block alone can provide, you may consider reinforcing the wall with steel rods. Drill holes in the concrete floor, and set steel rebar into the holes with new concrete, checking them with the level. You will then lay your blocks so as to thread the hollow spaces around the rebar.